Mission accomplished for the 2018 seal pup season! Cap-aux-Meules, March 19, 2018- It's mission accomplished for the 2018 winter seal pup watching package offered by the Château Madelinot. Mother Nature may have been uncooperative with ice conditions in 2016 and 2017, but she was generous this year during the season extending from February 23rd to March 11th on the Magdalen Islands. 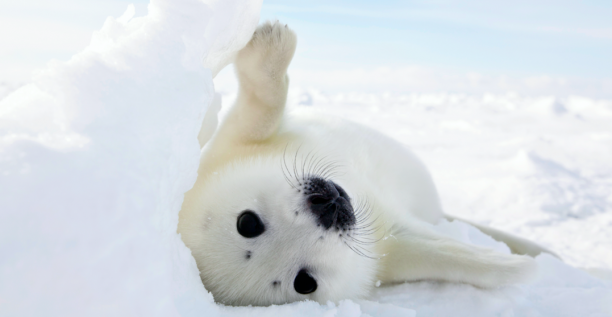 For 17 days, approximately 170 clients had the privilege of travelling by helicopter to observe a very large concentration of harp seals during the whelping period. The average flight time to get to the ice shelf from the Château Madelinot was 30 minutes. In addition to the helicopter tours, clients enjoyed the other activities we offered: ice fishing, photo safaris, cultural visits, meetings with local producers and artisans, hiking under the stars, wildlife watching, sunrise and sunset photo shoots, and much more! Throughout the season, our guests, representing 12 nationalities, quickly became fans of the local cuisine. Having the opportunity to eat Magdalen Islands lobster during the fishing season is a delight, but you can imagine how thrilled our clients were to be able to feast on it in March! The stakes were high for the 2018 season, given that the seal pup watching activity had been cancelled the two previous years, and the Château Madelinot team is very proud of how things unfolded this season. In general, guests participating in this type of nature tour are usually aware of the chances that activities might have to be cancelled or modified and it's clear how much more they enjoy their experience when things go as planned, because they are aware of how privileged they are, according to Ariane Bérubé, Sales Director for Hôtels Accents. This is a shift in dynamics for us, giving us a fresh outlook on marketing the product in the years to come. The economic impact of this trip for the Magdalen Islands as a destination and for the Québec Maritime region are considerable, mainly because this is usually a quiet time of the year for tourist activity. The Château Madelinot will welcome guests from around the world again in 2019 for an exceptional winter experience on the Islands. Information about the 2019 season will be available by the end of April. With Auberge Madeli - "Has it All", the Château Madelinot - "Seafront" and the Bistro Accents restaurants, Hôtels Accents is proud to contribute to the development and international exposure of Quebec as a destination.